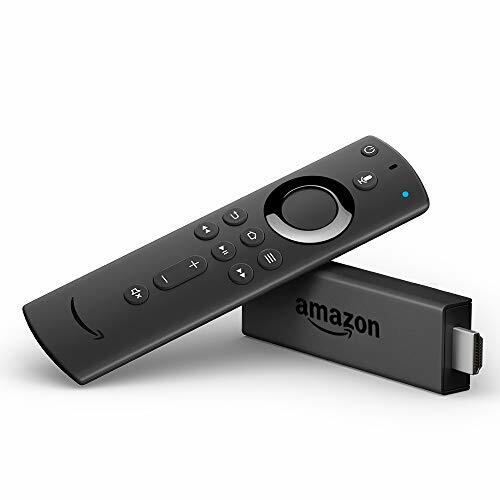 Switch seamlessly between your headphones and sound system-pair compatible Bluetooth headphones with Fire TV to listen to movies, TV shows, and music. Want to start streaming? then start here. 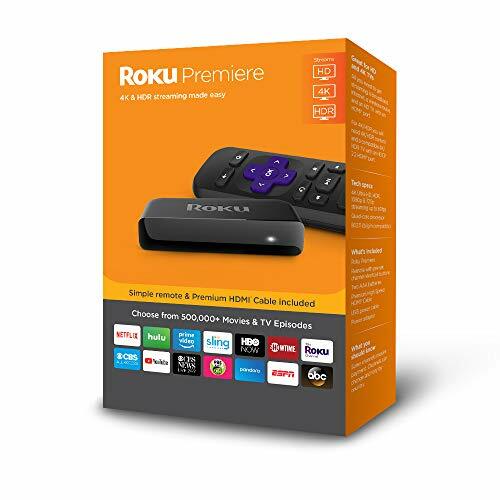 Our best-priced player, Roku Express delivers a smooth HD streaming experience on your big-screen TV. Our next generation player is now 5x more powerful. 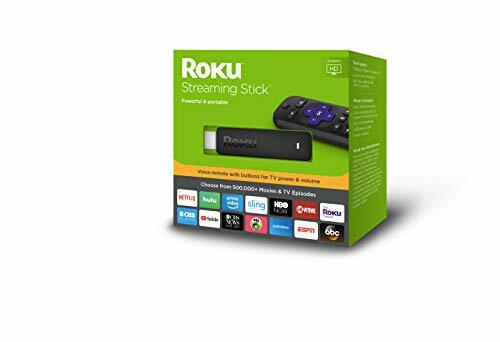 It s easy to get started, just plug it into your TV with the included high speed HDMI cable, connect to the Internet, and start streaming. Use the remote to search for your favorite shows and discover channels. Enjoy 500, 000 Plus movies and TV episodes, including blockbusters, award-winning original Series, kids shows, live network TV, and more. TV Compatibility HD TVs Up to 1080p (1920 x 1080) with up-scaling from 720p. 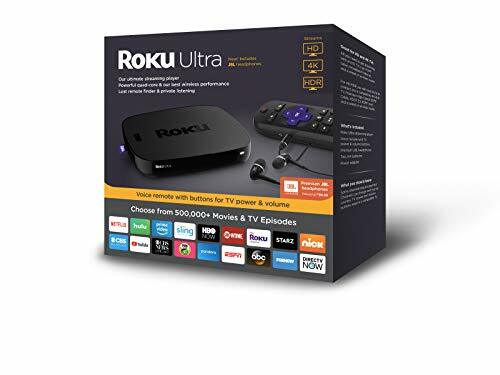 Brand: Roku | Manufacturer: Roku, Inc.
Fire TV Cube is a hands-free 4K Ultra HD streaming media player with Alexa, allowing you to control your TV from across the room. Just ask Alexa to turn on the TV, dim the lights, and play what you want to watch from over 500,000 movies and TV episodes. With far field voice recognition, eight microphones, and a built-in speaker, Fire TV Cube hears you from any direction and allows you to control smart home devices and more with Alexa even when the TV is off. 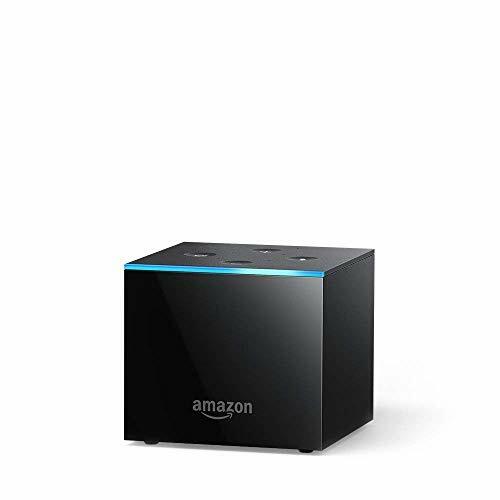 With far-field voice recognition, eight microphones, and beamforming technology, Fire TV Cube hears you from any direction. Enjoy hands-free voice control of content-search, play, pause, fast forward, and more. Plus control the power and volume on your TV, soundbar, and A/V receiver as well as change live cable or satellite channels with just your voice. Fire TV Cube has a built-in speaker that lets you check the weather, listen to the news, control compatible smart home devices, and more-even with the TV off. Fire TV Cube is always getting smarter with new Alexa skills and voice functionality. Experience true-to-life picture quality with access to vivid 4K Ultra HD up to 60 fps and HDR. Enjoy the audio clarity of Dolby Atmos on select Prime Video titles. An Amazon Prime membership unlocks thousands of movies and TV episodes including Thursday Night Football and Prime Originals like The Big Sick and Sneaky Pete. 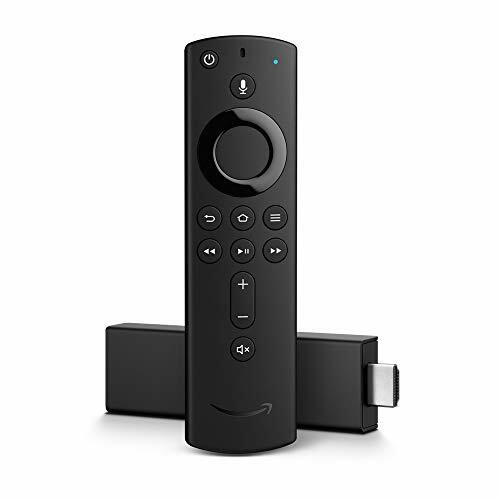 Launch and control content with the Alexa Voice Remote (2nd Gen). Watch favorites from Netflix, Prime Video, Hulu, STARZ, SHOWTIME, or CBS All Access, plus stream for free with Pluto TV, IMDb Freedive, and others. Incredible picture with an even more incredible value. The new Roku Premiere is the simple way to start streaming in HD, 4K Ultra HD or HDR. 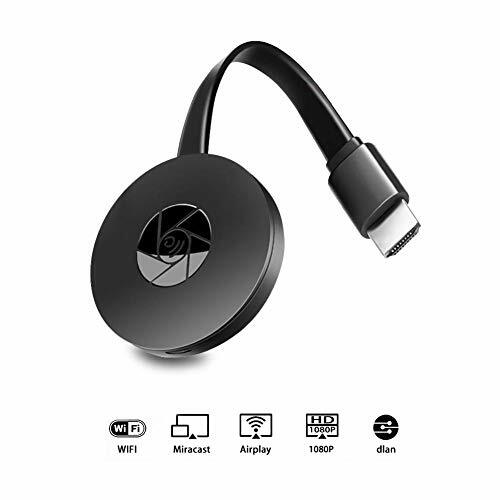 Just plug it into your TV with the included Premium High Speed HDMI Cable and connect to the Internet. With a short step-by-step setup and an easy on-screen experience, you ll be watching in minutes. Use the simple remote to search for your favorite shows and discover thousands of free and paid channels to stream almost anything, including hit movies, popular shows, live TV, news and sports. Plus, with access to hundreds of free channels, there s plenty to stream without spending extra. Entertainment lovers, this is for you. 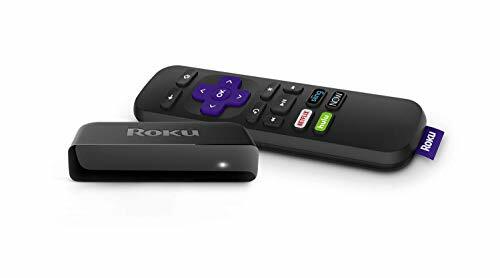 The Roku Ultra is our top-of-the-line player with a powerful quad-core processor, our best wireless, and an Ethernet port, for ultimate connectivity that stands up to what you want to stream. Whether you re watching in HD, 4K Ultra HD, and HDR, you ll get picture quality that s optimized for your TV with crisp detail and rich color. Plus, it s got all the bells and whistles, including a voice remote with TV power and volume buttons, private listening, lost remote finder, night listening mode, and premium JBL headphones, valued at $39.95. With Roku premiere, don't just watch your favorite shows, be immersed in them. Whether you're streaming in HD, 4K, or HDR, you'll get picture quality that's optimized for your TV with crisp details and rich color. Tablo is a network-connected DVR that streams live and recorded over-the-air (OTA) TV from your digital antenna to any screen, any time, anywhere using the table app. Table QUAD can stream or record up to four OTA TV channels. 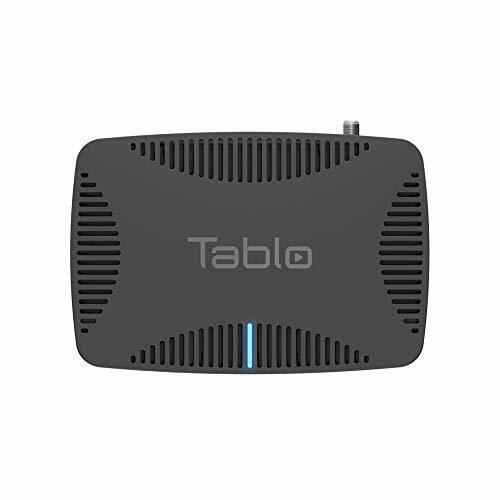 A whole-home DVR for cord cutters, Tablo is the only OTA DVR that allows you to use either Ethernet or dual-band AC Wi-Fi to connect your TV antenna to your home network so you can place the DVR and antenna in the best location for OTA TV signal reception. Customers should verify that they can receive local broadcast TV channel reception by connecting an antenna to their TV before connecting it to their Tablo DVR. Tablo apps are available free for smart TVs, streaming media and gaming devices, including Roku, Fire TV, android TV, Apple TV, Chromecast, and Xbox, as well as iOS/Android mobile phones & tablets, and computers. Out of home streaming and advanced features require an active subscription to Tablo guide data (optional, sold separately). for technical assistance contact 1-844-822-5688. SofaBaton R2 remote is an universal programmable infrared-enabled remote for Roku streaming player. 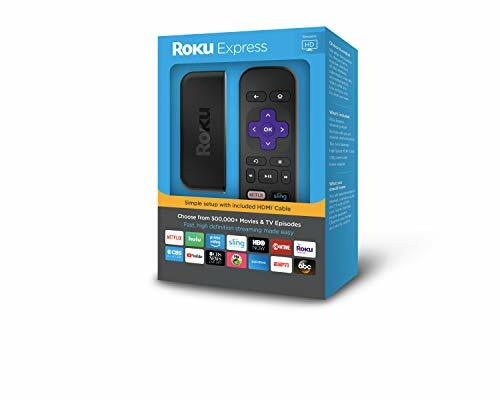 The lower part is an universal Roku remote that support Roku streaming player like Ruku 1,2,3,4, Roku Express&Express+, Roku Premiere&Premiere+, Roku Ultra. 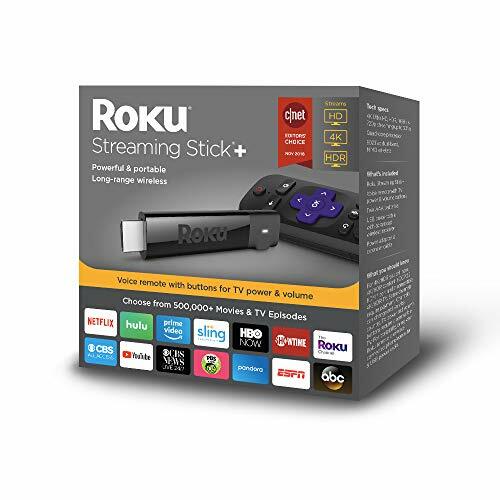 A programmable Roku universal remote control that integrates your Roku+TV+soundbar remotes into one by learning frequently used button functions into a Roku universal remote. Merge 3 in 1, rather than 2 in 1. 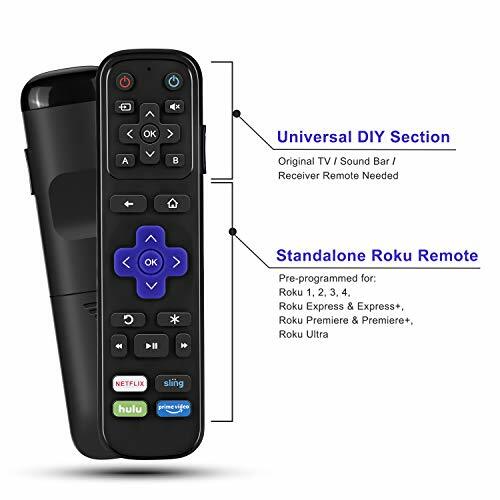 With 2 power on/off buttons and 11 others perfectly lay out on upper half, this universal remote accomplish the mission of combining at least 3 of your device remotes into 1. Programmable DIY Section Replenish those missing yet wanted buttons on Roku remote. Meeting everyday needs with 13 personalized DIY buttons using IR learning technology, such as power on/off, volume up/down etc. Warranty SofaBaton offers 1 year warranty for exchange or refund service. Contact us through customer service email enclosed in order for any advisory/complaint. Fire TV Stick devices have more storage for apps and games than any other streaming media stick. Experience tens of thousands of channels, apps, and Alexa skills, plus browse millions of websites like YouTube, Facebook, and Reddit using Firefox or Silk. 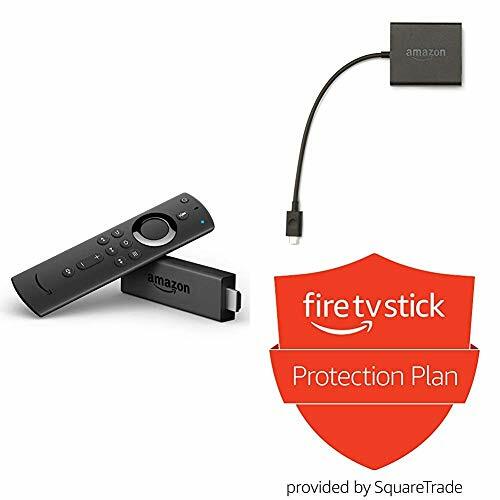 Includes Amazon Ethernet Adapter - simply connect the Amazon Ethernet Adapter into the USB port on your Fire TV and plug in an Ethernet cable directly from your router. Two Years Warranty: Suntee has a standardized production process, we have confidence in the quality of our products so we provide strong after-sales service. If you have any problems during use, do not hesitate to contact us, we provide 2 year warranty and 24/7 service. HDMI:HDMI 2.1,Support HDMI CEC, Dynamic HDR and HDCP 2.2,4Kx2K@75 max resolution output. 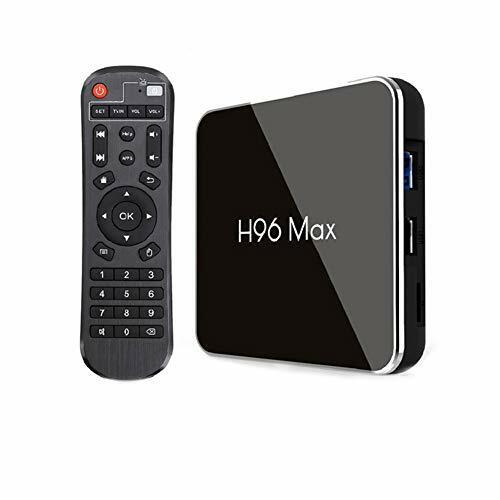 [Android 8.1 OS]:The H96 Max X2 TV box come with updated Android 8.1 OS, It has a perfectly compatible with majority of software, games and application programs, it has many convenient operation options and functions which can give user a better experience. 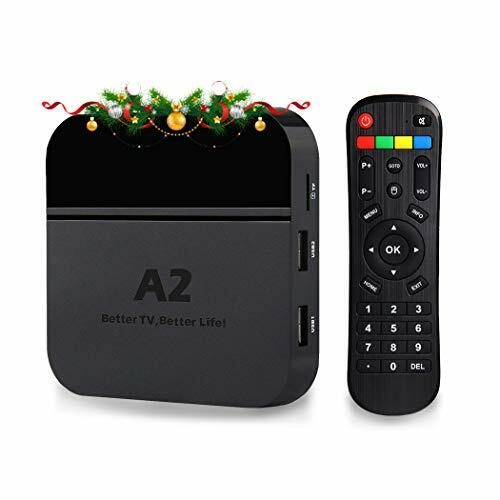 [4GB RAM+32GB ROM]:Android 8.1 TV box provides fully enough space with 4GB RAM+32GB ROM without having to always worry about running out of space,run faster and more stable,and you can quickly start your apps and games. [The Newest Advanced Device]: The Smart TV box equipped with quad core 64 bits Cortex A53 CPU up to 2.0GHz,which let you load the video, open the apps, watch live, play games more smoothly, and has a high performance in the graphics processing. 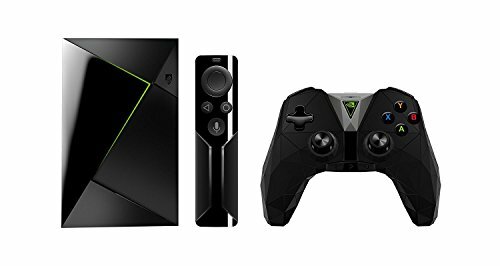 [4K Ultra HD and 3D HDR]:The android 8.1 tv box supports 4Kx2K Ultra HD and 3D HDR video decoding, you'll experience true-to-life picture quality when watching movies or playing games all the details will be caught by your eyes. 4K Canais do Brasil M s de 200 para programas de televisi n populares, deportes en vivo, ltimas pel culas: A2 TV Box Brazil tambi n es compatible con reproducci n de 7 d as, transmisi n en vivo y video a pedido. Ultra HD 4K / 2K Visual Enjoyment Brazil TV: compatible con la tecnolog a de decodificaci n H.265 HEVC, 3D, experimenta una calidad de imagen real y te llama la atenci n. Admite WiFi est ndar de 2.4G y 10 / 100M Fast Ethernet incorporado para conectar puertos y dispositivos, lo que facilita el entretenimiento en el hogar a trav s de IPTV Brasil. SO DE ANDROID 8.1: venga con el sistema operativo Android 8.1 que reacciona de manera r pida y positiva y carga pel culas, im genes y juegos de manera m s fluida. Mejor compatibilidad con varios software, juegos y aplicaciones, lo que proporciona una mejor interfaz de usuario y experiencia. IPTV6 Brasil con el procesador A5 de cuatro n cleos que puede funcionar hasta 2.0 GHz, puede disfrutar videos sin problemas con la GPU Penta-core Mali-450. Memoria de 2GBDDR3 / eMMC de 16GB interna: mayor velocidad de funcionamiento sin almacenamiento en b fer o sin espacio suficiente y espacio suficiente para instalar varias aplicaciones de software, juegos, etc. Expanda el almacenamiento a trav s de la ranura para tarjeta micro SD (hasta 128 GB). Nunca te preocupes por quedarte sin espacio. UN A O, NO HABLAS DEVOLUCIONES Y GARANT A DE POR VIDA Y ASISTENCIA T CNICA LOCAL PARA TODA LA VIDA. Si tiene alg n problema con nuestra TV Box de Brasil, llame al (855)350-6616 desde las 9:00 a.m. a las 21:00 p.m. y te responderemos de inmediato. 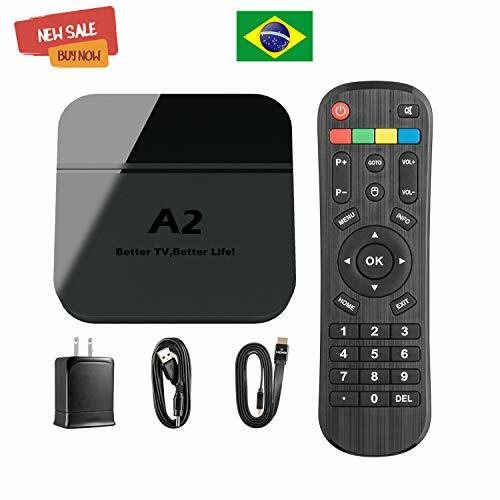 4K Canais Do Brasil M s De 200 for Popular TV Shows, Live Sports, Latest Movies - A2 TV Box Brazil also supports 7 Days Playback, Live Broadcast and Video-on-Demand. Ultra HD 4K/2K Visual Enjoyment Brazil TV - Supporting H.265 HEVC Decoding Technology, 3D, experience true-to-life picture quality and catch your eyes. Support standard 2.4G WiFi and build-in 10/100M fast Ethernet to connect port and devices, which makes home entertainment easier through IPTV Brazil. ANDROID 5.1 OS - Come with Android 5.1 OS which reacts quickly and positively and loads movies, pictures and games more smoothly. Better compatibility with various software, games and apps which provides better user interface and experience. IPTV6 Brazil powered by Quad-core A5 processor which can run up to 2.0GHz, you can enjoy videos flawlessly with Penta-core Mali-450 GPU. 1GBDDR3 Memory / 8GB eMMC internal - Higher running speed without buffering or breaking down and enough room for installing various software apps, and games etc. Expand the storage via micro SD card slot (up to 128GB). Never worry about running out of space. ONE MONTH NO HASSLE RETURNS & LOCAL TECH SURPORT. If you meet any problems with our Brazil TV Box, please call (855)350-6616 from 9:00 A.M. to 21:00 P.M. and we'll respond to you immediately. The box just designed for Brazilian. Because it is professional, it is even better.! 7 DAYS PLAYBACK: Support 7 days play back. Save live conten for 7 days, as long as you click Brasil Playback, you can choose the tv station that you want to play back. Slow down for 7 days, you will never miss any wonderful live moment.